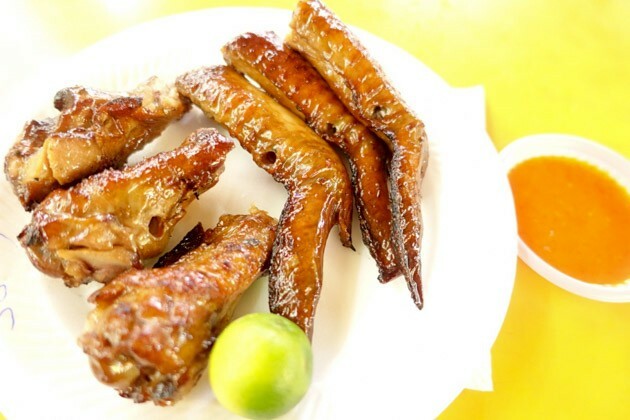 BBQ Chicken wings – a simple hawker food every Singaporean is familiar with. 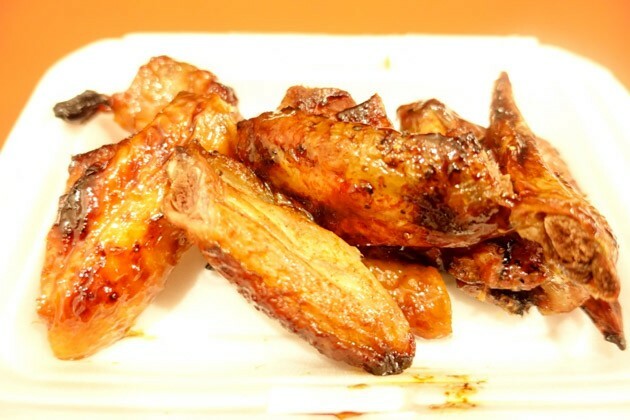 Even kids as young as five years old fall in love with these grilled wings. 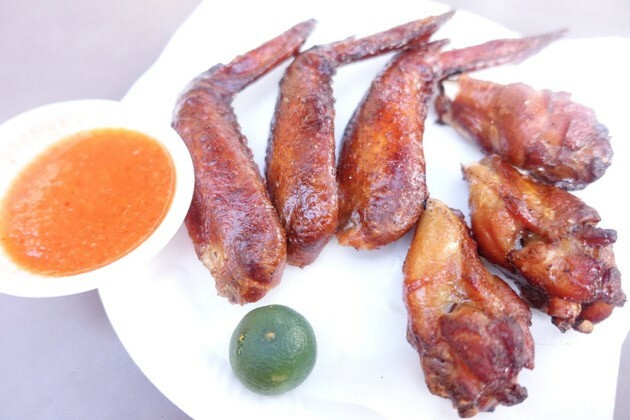 Many of us pretty much adore the Singapore way of eating BBQ chicken wings – flavourfully marinated chicken meat with the fragrance of barbecue cooked over charcoal. 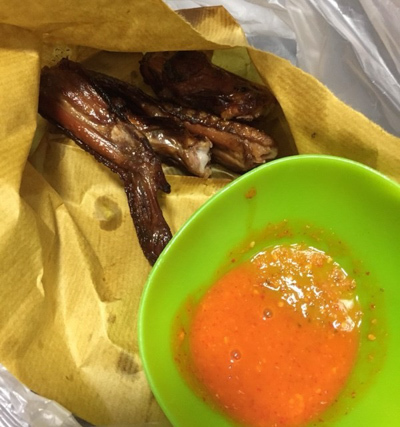 Sprinkled with lime juice squeezed all over them before dipping the wings into spicy chilli sauce, Singaporeans have indeed taken their preparation and eating of wings to a level of its own. 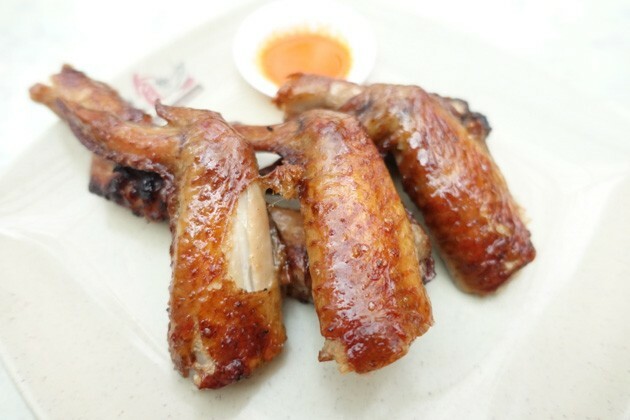 Here in Singapore, BBQ chicken wings aren’t only available on the menu at bars, restaurants and eating houses. Instead, the best finds are actually prepared in street hawker stalls situated within coffee shops or well-known hawker centres all over our sunny island. With that, I hereby introduce some the Best BBQ chicken wings in Singapore to savour quality wings, conjured in the manner of our very own local flavour. 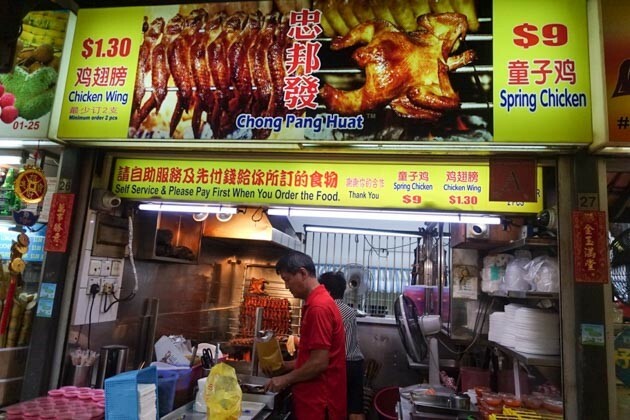 Located at Fengshan Food Centre, the bbq chicken wing ($1.40 per piece, minimum 2 pieces) at this stall is conjured from a secret recipe and then barbecued for a smokey finish. The skin was of an aromatic crisp, without much burnt edges. 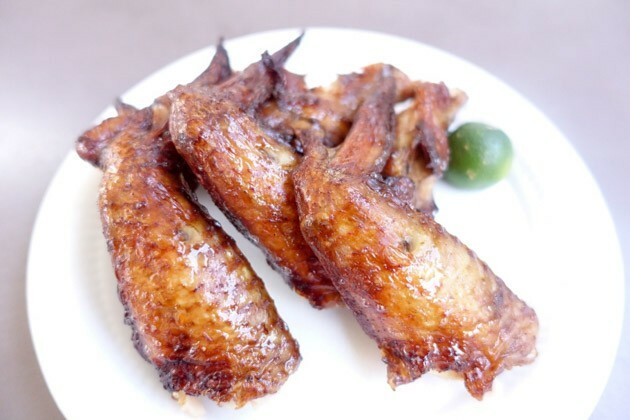 Upon bite, the oil oozes delectably with the lime juice squeezed onto the chicken skin. The drumlets were rich in meat and very chewy while the winglets were able to bring out the papery crisp texture of the barbecued skin. 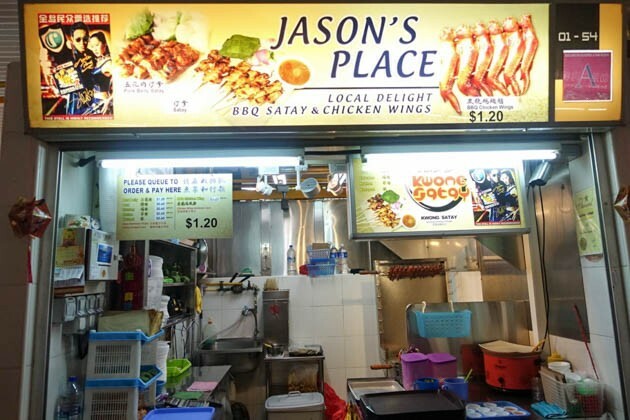 One of the selection of stalls that sells BBQ Chicken wings at Changi Village Food Centre, the BBQ Chicken Wings ($1.20 per piece, minimum 2 pieces) at Jason’s Place has an interesting flavour, special to its own. The wings were a bit on the skinnier side thou. Despite the meat being thin, it was barbecued to a degree of smooth tender. The skin was slightly charred, but it was the contributing factor to the crispy fragrance exuded when biting into the chicken. 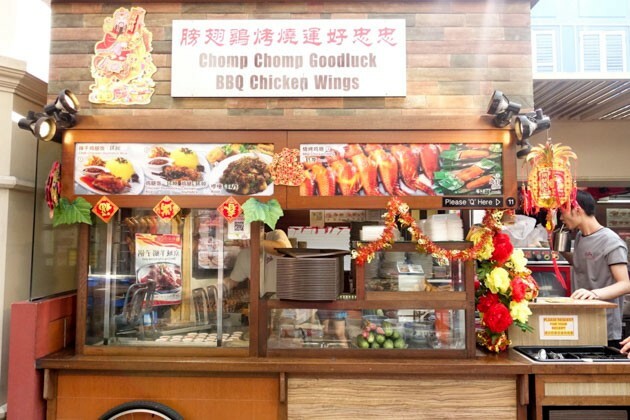 I will choose to eat the chicken wings from this stall again while at Changi Village. 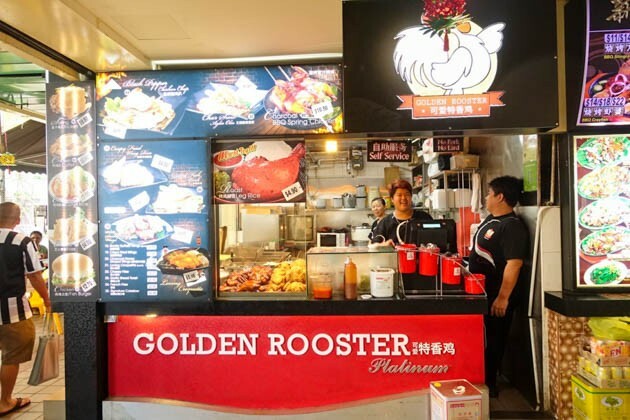 One of the subsidiary banners of the local franchise Tenderfresh, Golden Rooster is a Western stall that has its outlets spread islandwide. Different outlets have a bit of difference in terms of taste also to the individuals cooking it, but the menus and recipes are the same. 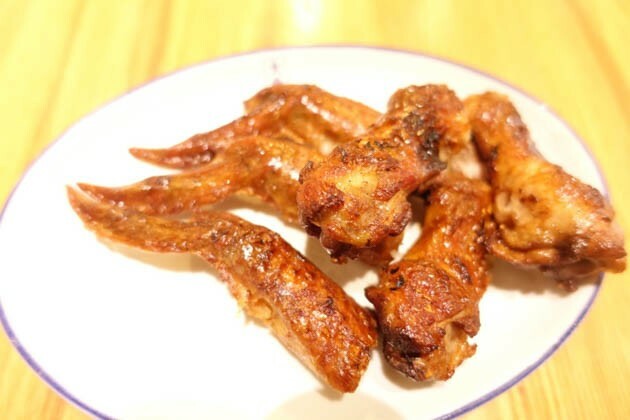 The charcoal honey glazed wing ($1.40 per piece) was coated with a thin layer of glazed honey, making the winglets and drumlets a sweet and savoury delight upon taste. 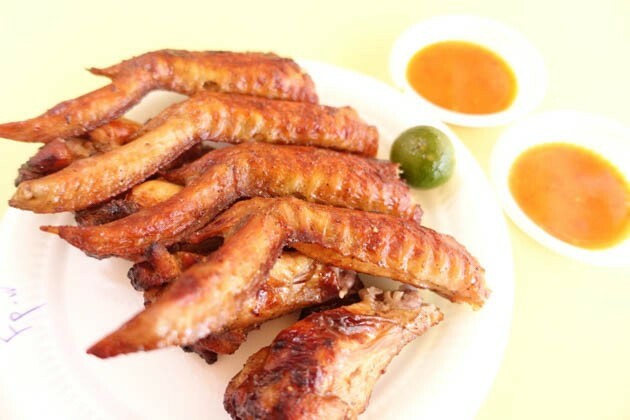 The honey glazed skin is a delectable pairing with the rich and tender meat. 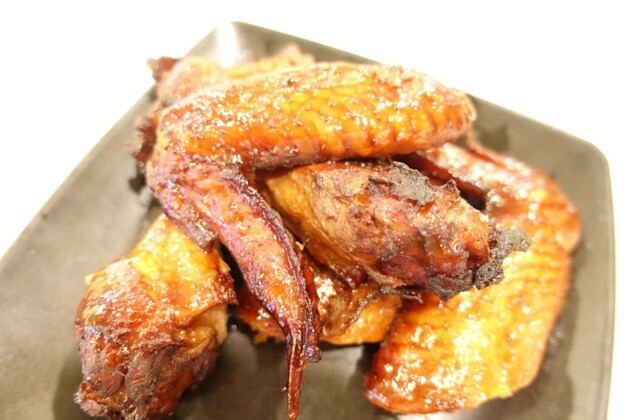 Having several branches located within the central zone of our island, Huat Huat Barbecue Chicken Wings serves genuine, Singapore-flavoured bbq chicken wings ($1.50 per piece). These wings conjured from an original local recipe are mouth-watering in both appearance and taste. I specially love the papery crisp texture of the skin. An entire, large piece of it loosens out upon bite while exuding a delightful sweet flavour. On top of that, the meat was very smooth and tender. The wings served were not oily, just nice in terms of its moisture and degree of firmness. 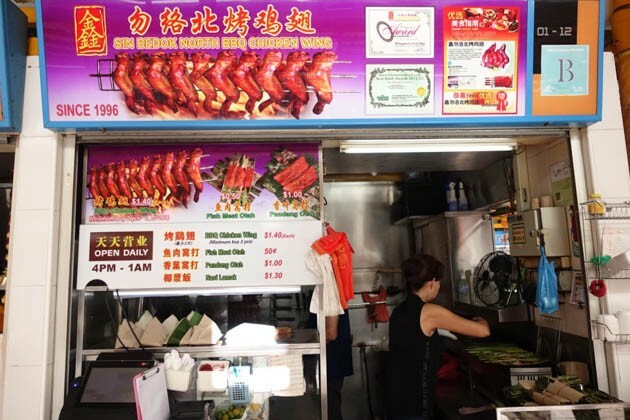 Considered the largest chain of stalls that sells chicken wings islandwide, Chong Pang Huat’s specialty, bbq chicken wings ($1.30 per piece, minimum order 2 pieces) has a special flavour of its own. The wings were not too sweet nor too sour, a flavour that is just right bringing out the richness of the chicken meat. A good flavour arising from a good degree of barbecue, with the wings being golden brown. A tasty and “healthier” choice of bbq chicken wings. One of the stalls located within the touristy Chinatown Food Street, the bbq chicken wings ($1.70 per piece) here may seem slightly pricey. Nonetheless, the quality of our very own Singapore-styled wings available here are worth every penny you pay for. Upon bite, one can literally smell and taste the fragrant effects of good ol’ charcoal barbecue. The meat was delicate in terms of texture, good to the bones. Here at Newton Food Centre, Weng’s BBQ Chicken Wing is opened till the wee hours. 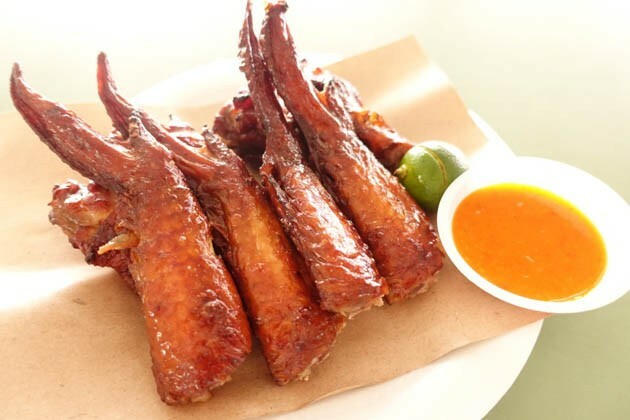 The bbq chicken wings ($1.30 per piece, minimum 3 pieces) are of an awesome taste and texture. Although the chicken wings were smoked and looks blackened, they were neither too overcooked nor too charred. What makes this bbq chicken wing stall stand out from the rest is the garlic chilli it serves together with its wings. Dipping into the chilli sauce gives the wings a delightful sour flavour, which pairs well with the slightly charred recipe adopted by Weng’s. **Note: Newton Food Centre is closed from 1 Feb 2016 till 24 April 2016 for renovation works. 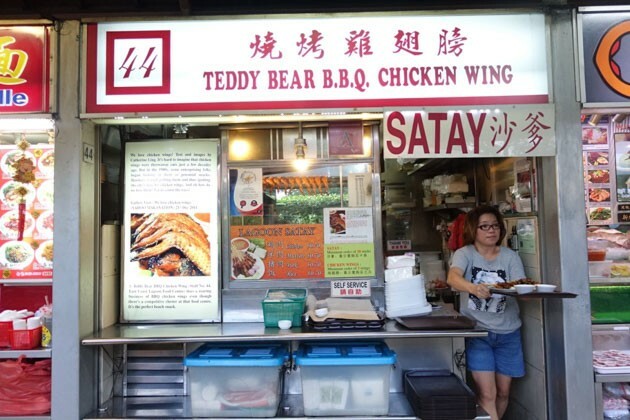 One of the stalls at East Coast Lagoon Food Village, the bbq chicken wing ($1.40 per piece, $4.20 for 3 pieces) at Teddy Bear BBQ Chicken Wing has its own unique flavour. The skin was the crispiest out of all the bbq chicken wing stalls which I’ve tried so far – Biting into it gives a crackling sound of crisp satisfaction. The entire wing was juicy, with the oil oozing lusciously upon every chew. Palatable indeed. 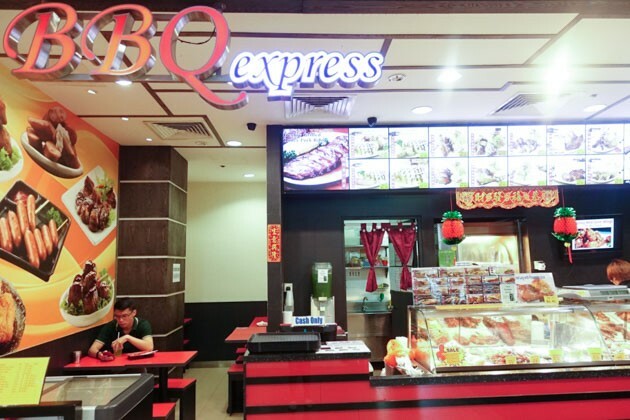 BBQ Express offers three different flavours of bbq chicken wings ($1.70 per piece, $4.90 for 3 pieces) — honey glazed, black pepper and Korean. Customers have the choice to mix and match flavours for the offered price of $4.90 for buying three pieces of chicken wings. Special highlights go to the Korean flavour bbq chicken wing. It being a newly launched flavour, I love it that I can taste the fresh and fragrant chilli marinate which it was barbecued with. The honey glazed wing here is the sweetest and most well glazed bbq chicken wing I’ve tasted so far. Similarly, the black pepper flavour was also very strong in its flavour, emitting pleasant bursts of black pepper upon every chew. Overall, I am much enchanted with the standard of cook produced by this local franchise. 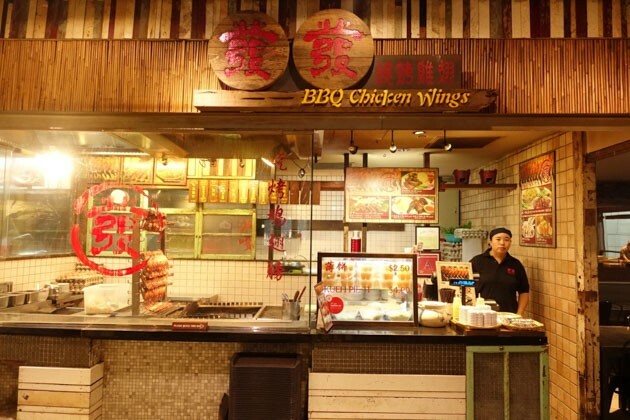 Ah Hwee BBQ Chicken Wings & Spring Chicken has a stall at East Coast Lagoon Food Village and another branch at Changi Village Food Centre. I must address that this hawker brand offers the best bbq chicken wings and spring chicken in the eastern region of Singapore. The bbq chicken wings ($1.30 per piece, minimum order of 3 pieces) were freshly prepared, on-the-spot cooking upon placing of order. Upon bite, the chicken skin exudes a heavenly degree of crisp, arising from a unique texture of its own. At the same time, the meat is very fragrant and tender right to the bones. An impressive standard given a very reasonable price paid. 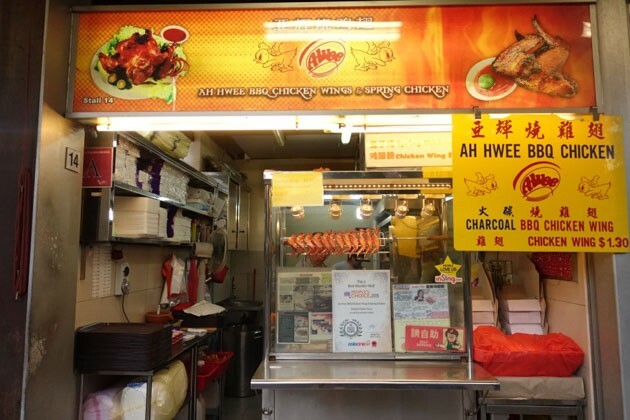 I really wouldn’t mind travelling all the way to the extreme east just for the sake of eating bbq chicken wings at Ah Hwee BBQ. Goal of looking at the bright side in every circumstance. I aim to effect change by influencing love to all creation. Be they the living or non-living. An appreciator of food, todds and furry domestic animals.